When the teacher met the student..
Macedonia is the largest and second most populous Greek region. 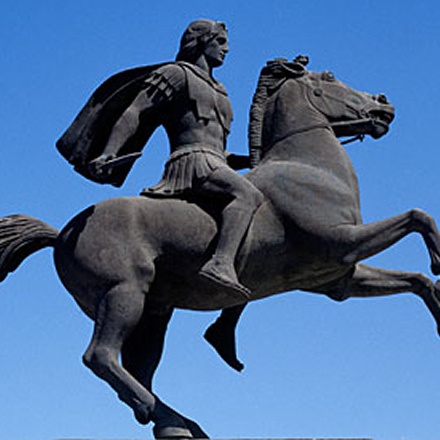 It incorporates most of the territories of ancient Macedonia, a kingdom ruled by the Argeads whose most celebrated members were Alexander the Great and his father Philip II along with the well-known philosopher Aristotle, Alexander’s teacher. - The Vergina Museum where the Tombs of the Macedonian Kings including King Phillip’s were found. - Ancient Stagira in Halkidiki, the birthland of Aristotle. - Mieza, the school that Aristotle founded to teach Alexander and his companions. - Thessaloniki, the 2.300 year old capital of Northern Greece. The city forms one of the largest student centers in Southeastern Europe – 150.000 students - and has been declared the “European Youth Capital” for 2014. In 2016, the world celebrates the anniversary of 2400 years since the birth of the Stageirite philosopher Aristotle and plenty of events are taking place throughout the region.